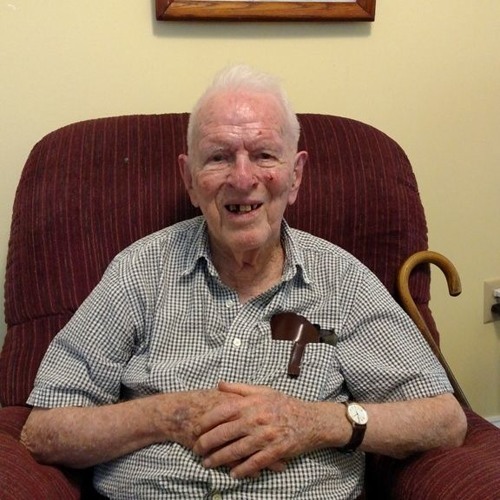 Bev Whiting was born in Winchester on September 26th, 1919 and has lived most of his life in Clarke County. He graduated Clarke County High School in 1937, served for three years in the U.S. Army from 1943-46 and ran his father's business (H.B. Whiting Co.) from 1940-1953. Many people in Berryville remember him as being the owner of the Berryville Newstand, which he ran from 1956-1979. As a youth, he remembers having long conversations with his grandfather, who fought for the Confederacy in the Civil Way. Bev currently lives at the Godfrey House here in Berryville and loves to paint. Above him in the photograph is one of his paintings.